Club Curry hosts an event of epic proportion each year to benefit a local charitable cause or community program. 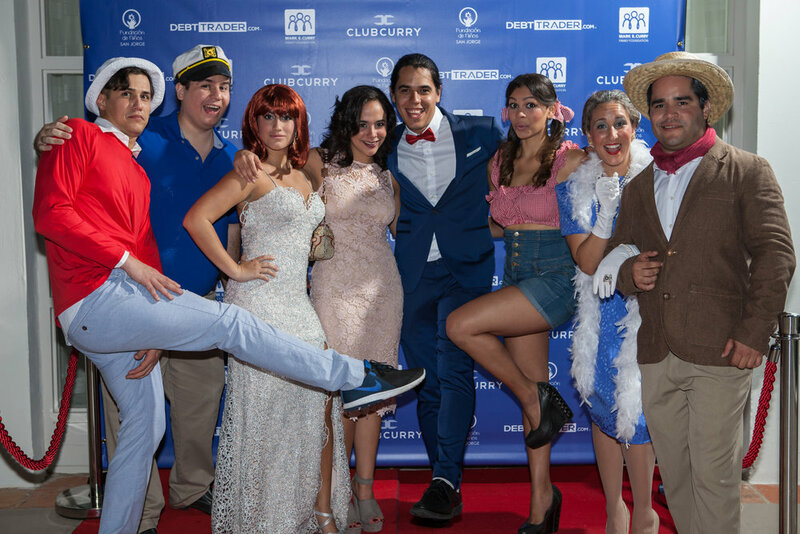 Club Curry is proud to have raised over $800,000 with spectacular events since its inception in 2010. Proceeds from Club Curry events have benefited charities dedicated to improving the quality of life for women, children and victims of domestic violence in Kansas City, Las Vegas and Puerto Rico. Have a look at some of the best and most memorable charity events Club Curry has thrown! San Jorge Children's Foundation is a non-profit organization dedicated to enhancing the quality of life for children and families in need by offering the most advanced medical treatment available. Our 2017 event “Club Curry: A Night at Gilligan’s Island” once again benefited the San Jorge Children’s Foundation and was held at the El San Juan Hotel in San Juan. Inspired by the 1960s sitcom, Club Curry 2017 took guests back in time to the set of “Gilligan’s Island.” There were bamboo cars and huts, wild natives and Mary Ann’s coconut creme pies! San Jorge Children’s Foundation used the funds raised to purchase a new facility with dedicated offices and meeting areas that will be used to better serve their patients. Thank you to all of our sponsors, donors and attendees; we couldn’t have done it without you! "Curry in Wonderland" was our biggest and best event to date! The 2016 event took place in San Juan, Puerto Rico on January 16, 2016 at El San Juan Resort and Casino. Guests were treated to cocktails, hors d'oeuvres and music by the world renowned DJ Nick Ayler. This magical, wonderland-themed event benefited San Jorge Children's Foundation and its mission to make a difference in the lives of children and families in need. "Curry in Wonderland" raised a total of $205,000 for the Foundation - currently their largest donation in history! Thank you to our sponsors, donors and attendees for making Club Curry 2016 such a success! Hope House provides shelter and comprehensive services to survivors of domestic violence in the Kansas City metro area. Weaving together safety, support and hope helps give survivors the ability to start a new life, free from abuse. Club Curry’s 2014 Speakeasy was a hit! The Prohibition-themed party took place on September 5th at Black on Burlington in Kansas City. Guests enjoyed ‘20s inspired cocktails, cigar rolling, black jack and plenty of dancing! To top off the fun, the 2014 event featured live music from renowned DJ Nick Ayler and endless entertainment from emcee Michael Mackie. The night ended with Club Curry-branded, copper mugs as party favors for all guests. Donations and proceeds from this successful event benefited Hope House and the women and children their services support. The Shade Tree is the largest shelter of its kind in Nevada, and is the only 24-hour accessible shelter designed specifically to meet the needs of women and children in Southern Nevada. The Shade Tree is a local grassroots agency with no national affiliation or support. The iconic board game Monopoly was brought to life at Club Curry’s 2012 Monopoly Mansion! Held at a private residence in Las Vegas, entertainers wore costumes inspired by the classic board game with men in top hats and women dressed as police officers. Partygoers relished in sophisticated cocktails, hors d’oeuvres and a special guest appearance from Lori Montoya of TLC’s “Sin City Rules.” The Monopoly-themed event benefited The Shade Tree shelter for women and children in North Las Vegas. Camp To Belong actively reunites brothers and sisters placed in separate foster, adoptive or kinship homes through its Summer Camp Programs and other year round events. The primary goal of Camp To Belong is to provide a sense of belonging to youth as individuals, and as siblings, giving them opportunities to share childhood memories together and among other youth in the same situations. Child Focus, part of St. Jude’s Ranch for Children in Southern Nevada, is devoted to the mission of preserving the sibling bonds of children separated within foster care. Through clinical case management, programming, events and activities, Child Focus provides opportunities for children in foster care to heal, grow, and maintain their sibling bonds during this difficult chapter in their lives. Club Curry’s New Year’s Eve 2010 was celebrated in style at Palms Resort Casino in Las Vegas! Partygoers said goodbye to 2010 in a VIP ultra-lounge with celebrity DJs, glittery confetti and fancy cocktails. At the stroke of midnight, guests joined in on the countdown and witnessed the famous Las Vegas NYE fireworks show! Club Curry’s first annual event was a great start to 2011 and just as successful as imagined.